As much as the computer age, we are living in the age of speed. 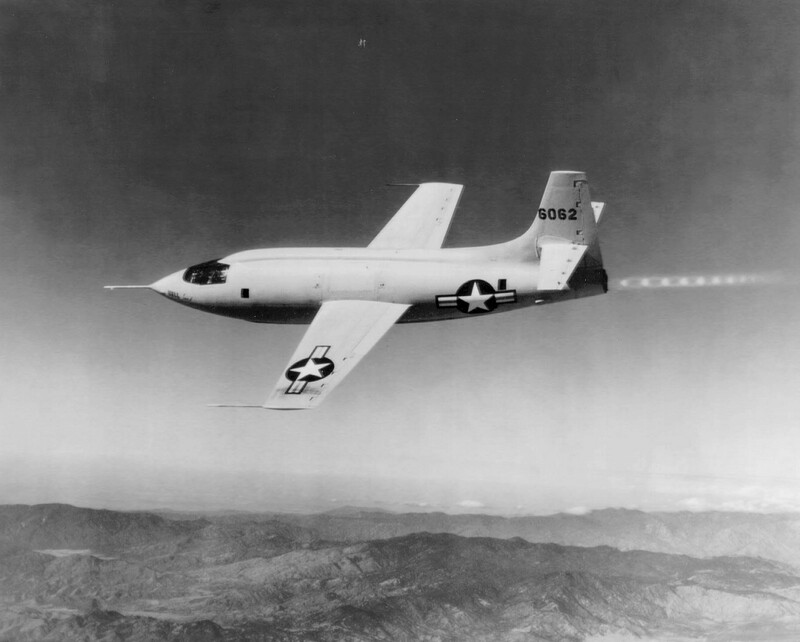 Chuck Yeager reached Mach 1 and broke the sound barrier in 1947, the year of the first electronic programmable computer. Commercial trans-Atlantic jet service began in 1958, the year of the first transistor and integrated circuit. And just this month an unmanned hypersonic jet reached Mach 5, averaging 3,300 miles per hour for about five minutes. That’s faster than a speeding bullet fired from a high-velocity rifle, and quite possibly Superman himself. But there’s a big difference between this hypersonic flight and the ever faster computers that have penetrated nearly every corner of society, and now travel everywhere in pockets and purses, and even on some people’s faces. We don’t get to use the really fast airplanes. We’re actually flying slower than we were 50 years ago. It turns out we’re just too cheap to fly faster. We had our chance. For almost 30 years there was a really fast way to fly, but we didn’t buy enough Concorde tickets to keep it going (I didn’t buy a single one). So we’re back to where we started at the beginning of the jet age. Well not quite the beginning, that was a pretty rough era. The first jet airliners went through a series of accidents in the early 1950s as engineers and pilots struggled to figure out all of the challenges of the new airplanes. But by 1958, a Pan Am Boeing 707 departed New York bound for Paris, and the jet age was ready to take off. Though it was a bit of a slow start. The airplane had to stop in Newfoundland to refuel before crossing the Atlantic. But the era of speedy jets had arrived. 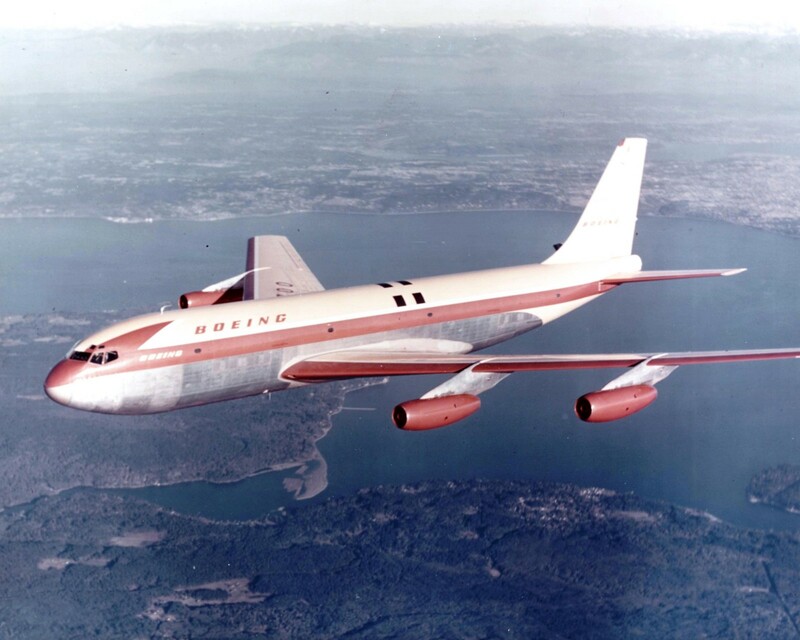 The Boeing 367-80, prototype of the 707. Time is money, but only up to a point. And with airplanes that point is reached as you approach the speed of sound, or Mach 1, about 675 miles per hour at the altitude airliners fly (the speed changes with temperature). Chuck Yeager exceeded the speed of sound back in 1947. But it wasn’t easy. His Bell X-1 starting misbehaving as the Mach meter moved closer to 1.0. It turns out shockwaves form around an airplane as it approaches and exceeds the speed of sound. These shockwaves create all sorts of physics problems that need to be solved. In addition to the increased drag that slows the airplane down at these speeds, one of the big problems Captain Yeager experienced was a total lack of pitch control, which moves the plane up and down. He could move the controls, but the X-1 didn’t respond. The supersonic speed made the horizontal part of the tail useless, dropping it into an aerodynamic shadow of sorts. The Bell X-1 Capt. Chuck Yeager flew faster than the speed of sound. The pilots and engineers eventually figured out how to fix the tail problem. And they figured out how to fly supersonic with relative ease. After a few more aerodynamic refinements, they just had to apply more power. They did this by pumping raw fuel into the glowing pipe you see at the back of a jet. They called it an “afterburner” and it created a lot more power. But pumping a stream of fuel into the tailpipe isn’t very efficient. So even modern fighter jets are limited in their ability to fly supersonic. Using afterburners will drain the fuel tanks dry in a matter of minutes. Engineers eventually figured out a thing called “supercruise” that allowed an airplane to fly faster than Mach 1 without using afterburners. This saved a lot of fuel and made it possible for airplanes like the Concorde to cross the Atlantic at twice the speed of sound. But again, we didn’t line up to buy tickets to ride on the sleek, cramped airplane, so now they attract museum visitors instead of passengers. We could be flying a bit faster today. 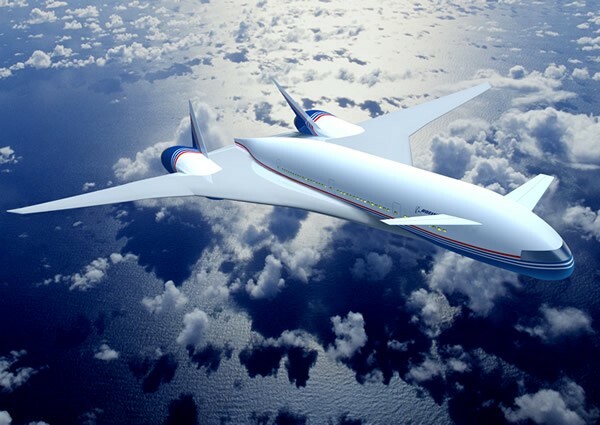 Early in 2001 Boeing announced plans for an airplane it called the Sonic Cruiser. The airplane was partly a way for Boeing to win back some attention from the then-recently announced super jumbo Airbus A380. The idea was to cut 20 percent off the time of your flight across the country. It wasn’t quite supersonic, but at Mach 0.98 it could fly faster than most of the other airliners, without all of the physics problems that require extra power, and cost. Whether or not Boeing ever planned to even build the Sonic Cruiser is not entirely known. But almost as soon as it announced the plans, it cancelled them. The company said passengers wanted a different kind of improvement. Instead of going 20 percent faster, the company designed and built an airplane that would fly using 20 percent less fuel. That airplane is the new fuel efficient 787, and it flies at Mach .85, about 560 mph. The newest, most technologically advanced airliner flying today is almost 10 percent slower than its grandfather, the 707. This year Airbus is following suit with its new A350, another fuel efficient jumbo jet. The flying public made itself clear, with its wallet: We don’t want to fly faster, we just want to fly cheaper. The airline business of today is all about efficiency, not speed. The cruise control is firmly set at Mach .85. But what about Mach 5? The super speedy airplane that flew this month was the first successful hypersonic flight with an air breathing engine. It was the fourth try for the X-51, a stubby winged, unmanned airplane that flew just over Mach 5. Every time the X-51, or anything hypersonic is in the news, the idea of flying from New York to Tokyo in a couple of hours is usually the headline. But hypersonic flight isn’t even coming to military airplanes anytime soon. The technology developed from the X-51 is going to be used for missiles, not airplanes. So you can stop dreaming about flying half way around the world in less time than it takes to watch an in-flight movie. You’re stuck at 560 miles per hour. Face it: You’re too cheap to fly faster.